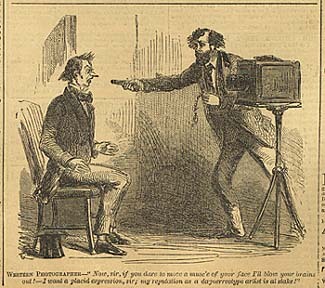 Western Photographer--"Now, sir, if you dare move a muscle of your face I'll blow your brains out!--I want a placid expression sir; my reputation as a daguerreotypist is at stake!" From Frank Leslie's Illustrated Newspaper. Vol. 7, No. 289 (28 May 1859) pg. 414.